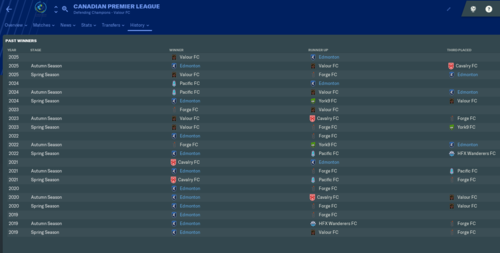 Introduction: The sole purpose of this file is to expand the US/Canadian experience for Football Manager as close to real life as reasonably possible. And if I do say so myself, I believe this file is the most realistic USA expansion for any version of Football Manager. There are a lot of different ways to enjoy this DB file. Take over your local NPSL or USL2 club (like my Emerald Force SC). Start with at the youth level, including the MLS academy teams. Do a Caleb Porter and build a college powerhouse before taking on the professional game. You can even make like Marc Dos Santos and start in one of the Canadian leagues (including the new Canadian Premier League). Or, just start in MLS while the pyramid below helps develop players for your dynasty. Major League Soccer: All default rules are still in place (salary cap, allocation money, contract types, All-Star Game, Drafts, etc). In 2019, as by default, FC Cincinnati joins the league (as is the case in real life). Expansion draft still occurs. 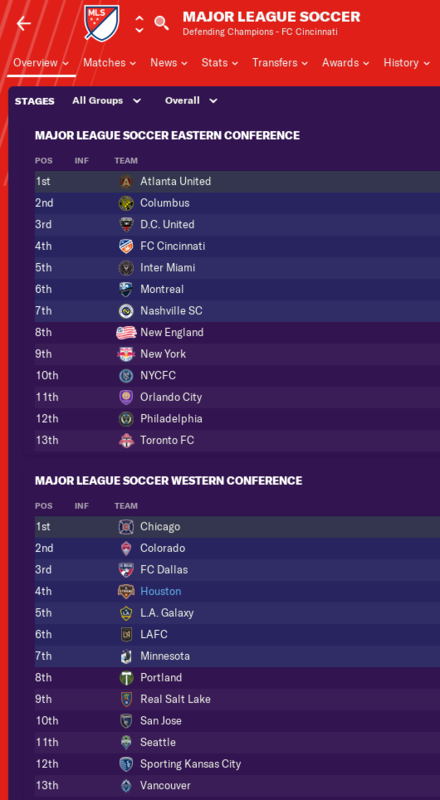 The big addition here is the 2020 expansion where Beckham's Inter Miami franchise joins the league along with Nashville, as is happening in real life. Some liberty was taken with the Nashville franchise, as they have not announced their branding yet. 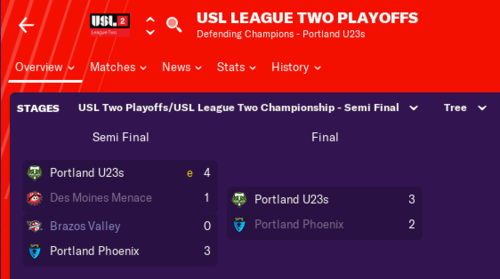 I simply "promoted" Nashville SC from USL Championship. The teams join the league as normal, however the expansion draft for 2020 does not seem to take place. 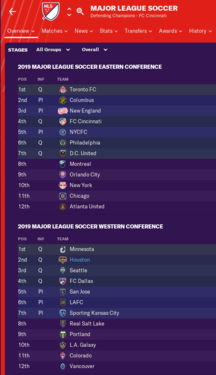 FM obviously realizes that expansion is happening because it shows on the calendar, however it never actually occurs as it does for the 2019 expansion. It's apparently a hard-coding issue. Also included is the recently announced changes to the playoffs, starting in 2019. Seven teams from each conference now qualify for a chance to win the MLS Cup, up from six. 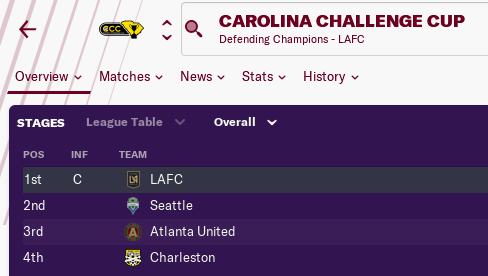 United Soccer League Championship: The league plays in 2018 with the same 33 teams from real life. In 2019, FC Cincinnati leaves the league to join MLS. Penn FC, Richmond Kickers, and Toronto FC II "relegate" to USL One. Austin Bold FC, Birmingham Legion FC, El Paso Locomotive, Hartford Athletic, Loudoun United FC, Memphis 901 FC, and New Mexico United all join the league for the 36 real life teams for 2019. In 2020, Chicago and Oakland join for 38. The 7 expansion clubs can be chose from USL League One at the beginning of the game. United Soccer League One: The league does not schedule any matches in 2018, however you can choose the clubs which do not play in other leagues at the beginning of the game (Chattanooga Red Wolves, Forward Madison, Greenville Triumph, Lansing Ignite, North Texas SC, Orlando City B, and the Rochester Rhinos) It also starts with the 7 expansion teams that join USL in 2019 so you can start with one of them and build the squad. League begins play in 2019. NPSL Pro: Does not schedule any matches for 2018 or 2019 and begins play in 2020. You can pick Cal United, Cal FC, or Oakland Roots in the beginning. In 2019, the NPSL Founders Cup generates with the 11 teams set to play in the NPSL Pro Division competing in the same format as it is set to in real life. National Independent Soccer Association - This league begins play in 2019. In real life the NISA will run on a Fall-Spring calendar, but this cannot be done in the FM editor when the rest of the nation runs on a Spring-Fall calendar. 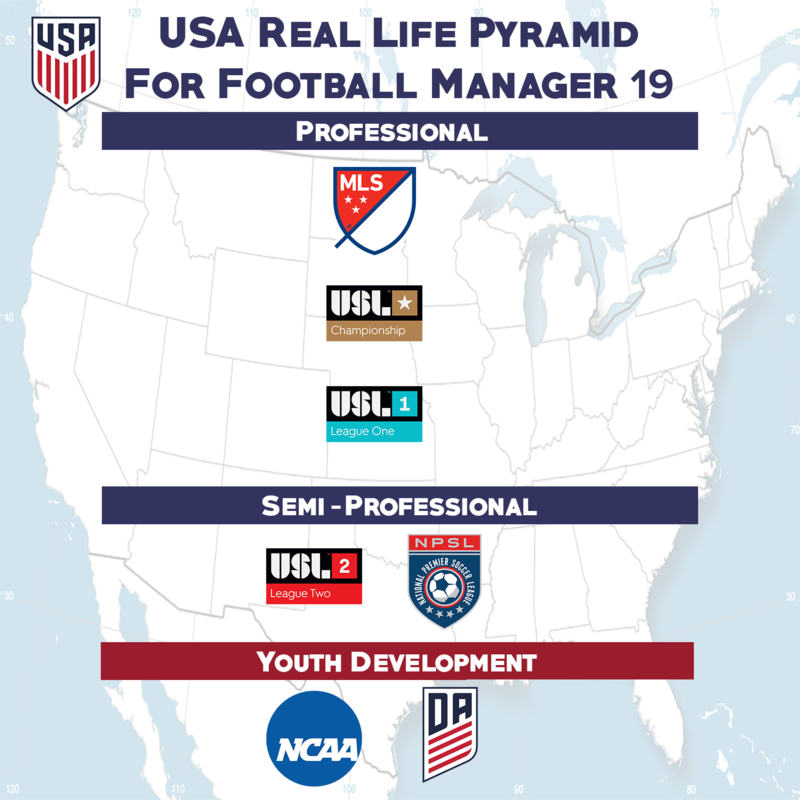 US Soccer Development Academy: This is where newgens are generated in USA in FM. Activating the division means that the youngsters will get meaningful matches. 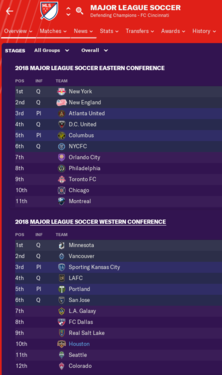 This league matches real life as much as possible, but in reality the league runs on a fall-spring schedule and FM doesn't allow one division in a nation to run fall-spring if the rest of the leagues run spring-fall. 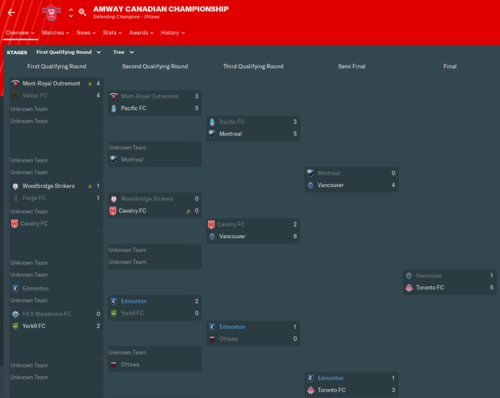 Canadian Premier League: Now that I know all of the rules, I have been able to recreate the CPL as it will function in real life. The league plays a 10-match Spring Season, a 18-match Fall (Autumn) Season, with the winner of each plays for the overall championship. If one team wins both the Spring and the Fall, the team with the second best record overall plays in the two-legged league championship. My file will record the winners of each half of the season, and the overall champion. I have also gotten the squad rules as close as I could to the real life rules (23 players, 7 foreign player maximum, and at least three U21 domestic players in the squad). Second Division: League1 Ontario and the PLSQ are recreated as close as possible to real life, including league cups. Third Division: Pacific Coast Soccer League, Canadian Soccer League, and the CSL Second Division. 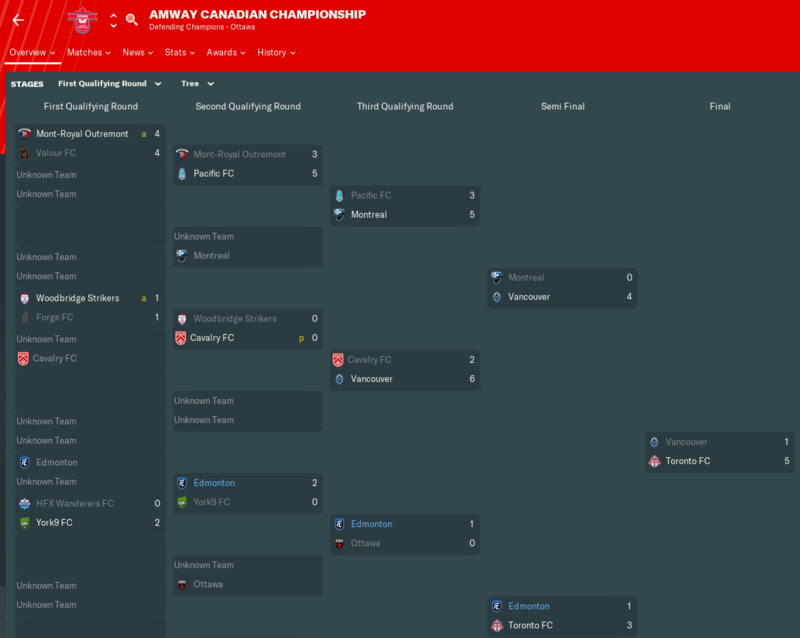 Canadian Championship: Is set to function as in real life. The six teams that participated in the tournament in 2018, with the CPL teams joining the other six real life teams in the 2019 edition. Starting in 2020 the L1O and PLSQ champions join the 7 CPL teams, the Ottawa Fury, and the 3 Canadian teams from MLS in the correct format. 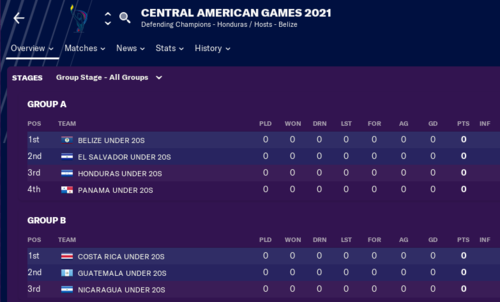 ADDITIONAL FILES FOR THE CONCACAF CLUB COMPETITIONS: Apparently modifying MLS in the editor causes the default CONCACAF Champions League to go haywire, so I rebuilt it. It functions better with the CONCACAF League and CFU Club Championship competitions which I also rebuilt. 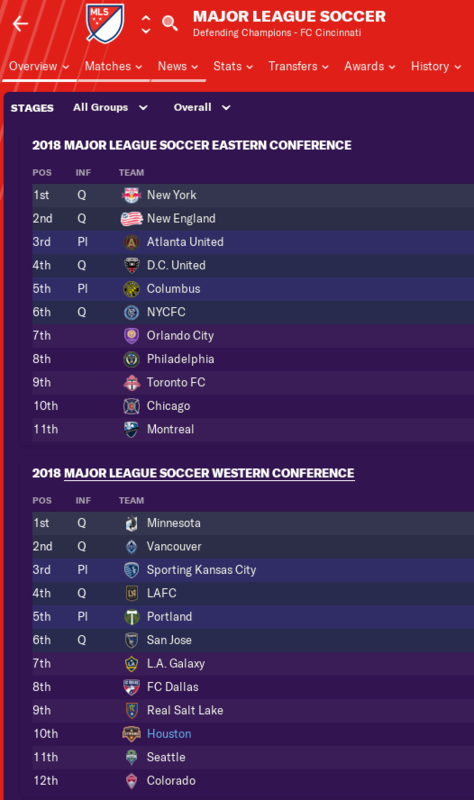 If you do not include these files with my USA-Canada expansion, the Champions League will not select the proper teams. For the Concacaf League and the Concacaf Champions League to function properly, you will need to drop the Mexico and Costa Rica leagues files into the "editor files" folder. These competitions have been modified to ensure that the correct clubs qualify for continental play. GRAPHICS FILE: Also included is a graphics file which contains logos for all American and Canadian teams. It also includes kits for all US teams and the CPL teams. -For whatever reason, the expansion draft does not happen for the 2020 or 2021 expansions. As best as I can tell, this is a hard-coding issue pertaining to MLS expansion. The expansion draft does still occur for FC Cincinnati. -Some NPSL and USL2 clubs won't fill their squads. Some teams will always have only gray players. I've tried different things, but for now there seems to be no way around this. My guess as to why this is the case would be because in FM, clubs in the USA do not develop new players. All new domestic American players come through the Academy system whereas clubs in other countries' have a yearly youth intake. I can't say for sure why some semi-pro clubs don't just go sign free players, but I'd say it's related to the unique US youth system in FM. -NCAA teams will not function exactly as they should in real life. FM sees the teams as amatuer U23 clubs. Their squads are usually automatically populated which I would suppose is because the SuperDraft pulls from them. -Professional clubs from USL2, and the Division 3 competitions will sign players from the NCAA and Academy leagues. I have done what I can to minimize this phenomenon, but it is unfortunately unavoidable and unrealistic. The somewhat good news is that it will happen less frequently as the game progresses after the professional clubs have filled their squads. DISCLAIMER: I have NO idea how this file will mesh with other database files. If you have an issue, by all means report it and I will try to make it compatible but I can make no promises on that. CONCACAF in the Copa Sudamericana - CONMEBOL used to invite teams from North America to compete in the Copa Sudamericana. That deal ended when CONCACAF changed the format of the Champions League and started scheduling matches in the fall when the Sudamericana was played. Now that the Champions League has returned to playing all of their matches in the spring, there has been some discussion of allowing North American teams in the Sudamericana again. 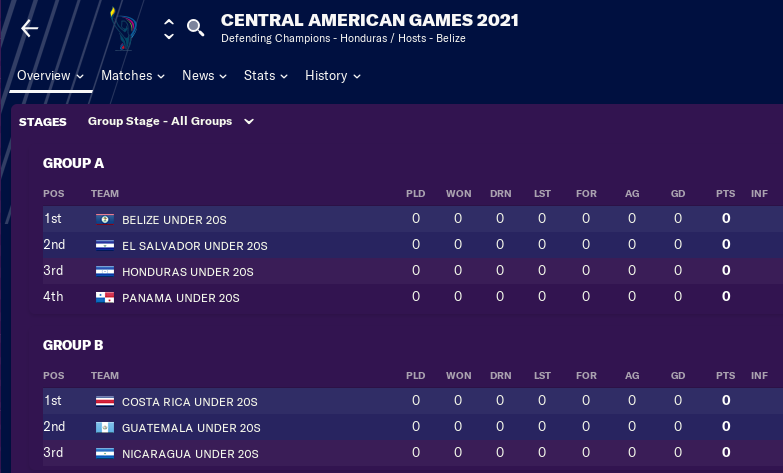 I remember playing in Sudamericana with the older versions of FM and it was a lot of fun, so I built this file that sends the CONCACAF Champions League winners and runner-up to the Sudamericana. Pan-Pacific Championship - This revives a now-defunct preseason friendly competition that used to pit the champions of MLS Cup against the champions of Australia, Japan, and South Korea in a one-leg knockout competition. There is a third place match so two matches are guaranteed. International Champions Cup - This recreates the summer friendly competition that is played mostly in the United States in real life. 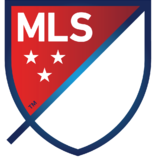 This version plays the entire competition in the US and adds the MLS Supporters Shield champion as well as the Libertadores champion, who has been invited in the past. USA January Camp - When I managed the US national team it always bugged me that I couldn't schedule friendlies in January because in real life they hold a camp for the domestic players (and guys who play in Spring-Fall leagues like Scandinavia). So I created this file to add the camp. The US will play two matches against nations chosen randomly from a list of countries that have played against in January in the past. Pan American Games - This is a real life youth competition for U22 teams from North and South America. It helps to prepare the national team programs for Olympic Qualifying. Copa Nuevo Mundo - In 2016 the USA hosted the Copa America. After the tournament was a huge success, there was talk about creating a new competition held every four years for the top national teams from CONCACAF and CONMEBOL. This is is that competition. 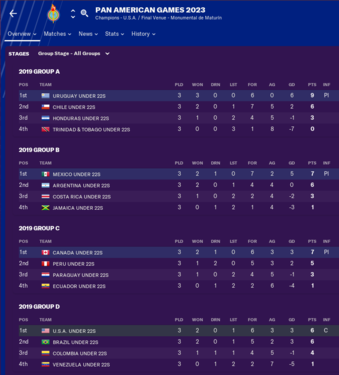 I call it the Copa Nuevo Mundo (Cup of the New World). It consists of 16 teams (8 from CONCACAF, 8 from CONMEBOL) held every four years in the United States. This file has a LOT of moving parts. I've done a lot of testing, but I'm sure there are some things that slipped through the cracks. If you come across something please post about it here and I will try to correct it as soon as possible. I am planning on adding a couple of optional downloads to enhance the experience. I will likely release a revival of the preseason Pan-Pacific Championship competition, which pitted the MLS champion against the Australian, Korean, and Japanese champions. Also the North American SuperLiga and a rebuild of the CONMEBOL Sudamericana where the CONCACAF Champions League finalists participate. Credits: this file is largely inspired by forum member paulgerty. He used to release a file much like this one. I haven’t seen him around in awhile, but without his work this likely wouldn’t exist. All of the editors whose files I examined to help me learn how the process works. They would be too many to name. Will you do this with promotion/relegation? Yo, I just want to say thank you for doing this every year. The american soccer pyramid is one of the most interesting and unnecessarily complex ones in the world. Thanks for the mention, looks very good. 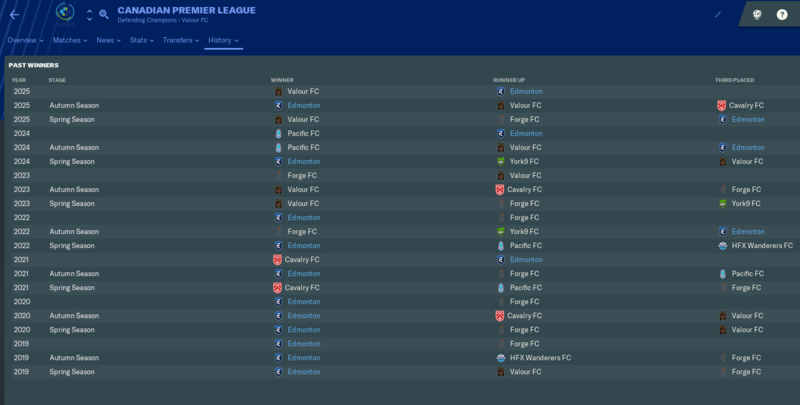 I have resurrected my old file for FM19 for personal use, but it's not quite as polished off this this one. Well done! There are lots of corresponding logos for team, competitions, conferences etc...I've not checked to see if they can just be dropped in. Jeremiah has done great work again here. I'd love to see this file really take off and Jeremiah get the credit he deserves. Please consider contributing to his Patreon for this, he's put a LOT of work in. I'd like to do a players pack for this at some point over the winter (including top NCAA players and top MLS academy guys, either at the academy or in NCAA). I will see if I can get to that and keep people up to date - I'm already working on the official stuff for the Feb patch. I thought about doing that. I asked around what exactly the "Is Institute" setting actually means in-game and the best answer I got (including from the SI staff) was basically to try and see what happens. Do you know what it does? Unfortunaly, no. I've got only guess, that it would help. I can check it for you if you like. I'd be interested in anything you can find out. From what I can see in the database it's for "football factory" academies. I honestly don't know if that would be good or bad for the NCAA teams. So, like the Vardy one or the Right to Dream? NCAA - biggest issue I can see here is the mechanism you are using for getting teams into the NCAA tournament. In prior attempts, I've put in, for example, the conference Regular season winner and Tournament winner (NCAA like a continental competition). In my test, Kentucky won the C-USA regular season, runner's up in the tournament and in their wider NCAA group and didn't get in. My system was imperfect in that it took set amounts from conferences like ACC each year, but I always made at least 1 spot available for each conference to make sure there was at least a pathway to the big dance. Any chance you could look at this? I should point out, I like the groups, because I think that's a good way to replicate the exhibition season etc...but maybe it probably shouldn't feed directly into the NCAA without some input from the conferences? Work in tandem or split? how do you have the CPL just having youth players coming from youth intake day no U-Sports draft or anything? I'm pretty sure you won't be able to pick Miami unless you're starting in 2019 somehow (late start date or holiday) , since they don't enter until the 2020 season. NCAA - other issue I've found are it's hard/impossible to sign new players. Every team apart from yours gets an intake on 1/1, not sure why it's not doing the same for the human managed team? I'm trying to find a work around in the game, but nothing so far. Could be a lack of GM/DOF. UPDATE: Adding a GM saw me get an intake (guys automatically signed). It seems LOTS of the ex USSFDA, especially ex-MLS academy guys, don't want to consider a move to a college (not just mine). Might be something to do with the reps? I could see hundreds of guys on frees who wouldn't talk to me at all (wont move because of the financial package on offer - IE amateur deal). Another issue I've found is the staff aren't able to be offered FT/paying contracts,. I seem to recall there's a way to set it so staff members can be paid salaries and be full time etc. Expansion/NCAA Feedback - where we are including new USL expansion teams I've seen they are populating themselves by signing a load of NCAA players. I lost 4 to one team in one season, and 11 in total. Only 1 was drafted of those, the rest went to expansion sides. 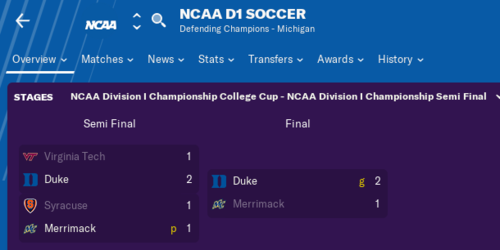 I'd probably prefer a version without the expansion sides at the lower leagues, as it is clearly messing with the NCAA. Either that, or perhaps I should start 2 seasons in. i have a question tho... i want to raise the number of DPIs to 8. i put in the squad selection rules in Rule 0, but nothing happened. can you guide me on how to do this please? Yeah, this seems off to me too. Jeremiah, was this something that I had set? Will Caribbean competitions work by themselves ?? I started as FC Cincinnati in USL Championship, but every transfer I attempt to make (even signing my academy players) is cancelled due to lack of funds. Any clue why? MLS Expansion International Slots (Inter Miami and Nashville SC) - This was the biggest ifix. Now they will have the 8 they are supposed to have by default. I had actually fixed this in an earlier version of the file but for some reason, I didn't have the fix in for the release. But it is now. I had to get creative for that (as well as many other things), but it works properly now. NPSL Northeast Region - The playoffs were not selecting the correct teams. That is fixed as far as I can tell. Where is the link to the new file? The one attached to original post is still the old version? So the International Slots is a pickle, it's why you can't have Pro/Rel in the default MLS. Only teams who have their Club Division set as Major League Soccer get International Slots (except for the hard-coded expansion teams, ie FC Cincinnati). The fix is actually pretty simple. 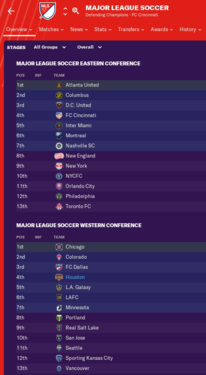 I set Nashville SC and Inter Miami's division as MLS. But in the rules, I tell MLS the specific 23 teams to use for the league stage in 2018, 24 in 2019, and 26 in 2020. 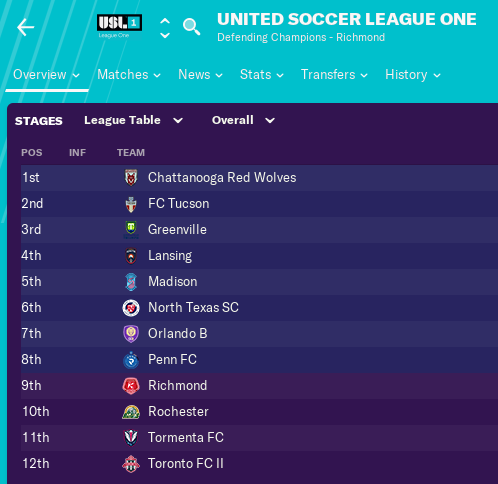 I also tell USLC to get the specific teams I want them to have each season (Including Nashville SC). 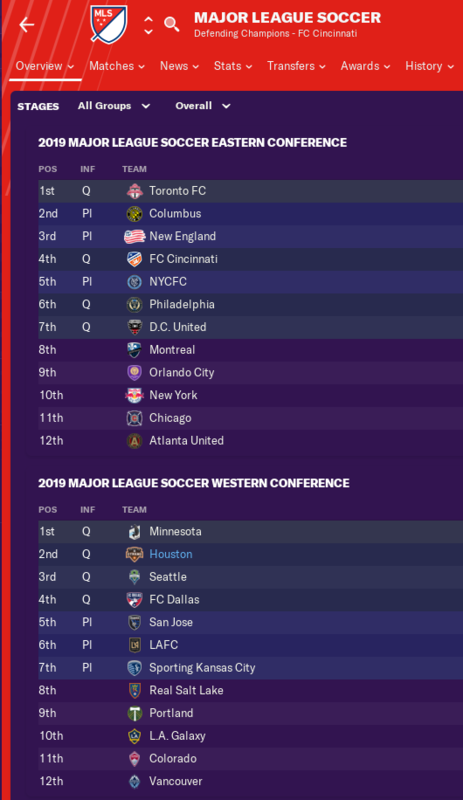 So even though Nashville's Division is set as MLS, they are actually playing in USLC the first 2 season. That works, because there is no promotion/relegation in USA. The Academy dynamic can NOT be recreated. I wish SI would make it a setting for the "Affiliation Type" where you can just set it as "MLS Academy". Maybe they'll do that in the future. EDIT: While you can't recreate the MLS Academy, I was able to circumvent it by swapping Nashville SC with Chivas USA. CUSA and their academy are still hard-coded with the default MLS academy dynamic so that works. Nothing can be done for Miami, I'm afraid. They start in the lower leagues, so they're unplayable until they join the league. I can probably come up with a fix for that. Look for it in version 2.4. Did you try and download it? If the file ends in FM19-2.rar, then that is the correct file. If you try and mess with the default MLS rules, sadly it kills all of them. Not yet, they haven't announced anything like that that I've seen. If you have, by all means link me and I will see if I can recreate it. OK guys, still efforting the file. For version 2.4, I'm looking at implementing the ability to take over expansion teams from the beginning. I don't think that will be too difficult. The NCAA also obviously needs to be looked at closer. That is the most difficult component of American soccer to replicate. I have a few ideas, so I might upload a couple of different versions of the file and see which one works best. I'll add that to the changes for 2.4. So are u adding in like a 3 round draft?.. also you going to put a post in the main post to find out what version of the save file it is so that we know? I'm going to try with the draft, the FM19 editor actually has that an option. However, I've never done that before so it will be a new process for me to figure out and I have to try and figure out where the draft will pull from players from, like the MLS Superdraft pulls from the NCAA in my file. Does anyone else have this issue? 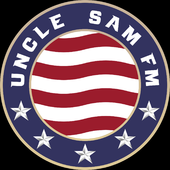 I've tried from multiple computers and it links to the "USA-CANADA Expansion Fm19-2" file with the 2.3 file as it should. Added the version of the file to the OP, good suggestion. Thank you. So the CPL draft draws from the Canadian U Sports college league. I could try and put it in, but I would need someone to create for me the U Sports raw data. That means each conference and team needs to be created. From what I could gather, there are four "conferences" and a total of 56 or so teams. The NCAA tournament is tough to figure out, but in real life ONLY the conference tournament champions get automatic berths except for the three conferences that do not have a post-season tournament. So winning the conference regular season doesn't necessarily mean you get in. I've tried a lot of different things to get the at-large sorted. I've used highest reputations, but sometimes High-rep teams don't deserve bids based on performance. I've also tried having the results from conference play processed into the non-conference groups but that fails verification because then the teams in the group have different numbers of total games. For example, Virginia plays 9 ACC games +10 non conference games for 19 total. Akron plays 5 MAC games +10 non conference for 15 total. The editor won't verify the rules because they have different numbers of matches. If someone knows how to work around that, I think that's best way to do it. There is nothing in the "Stage Flags" drop down that helps that and I don't see anything else that can be done. Thank you for all of the hard work that you've put into this file set. I really wish that SI would make this a part of the game so you wouldn't have to endure creating it from scratch, but I'm very happy that you put such dedication into creating the actual U.S. Pyramid. Thank you again & keep up the good work! I was already start my save with nashville, so theres 0 slot or ? There used to be a Canadian University file floating around a few years ago...not sure if you can find it or what could be imported. If it's just the data for the Canadian universities in U Sports I could pretty easily import it. Yes, apologies. You'll need to restart. Doesn't look like USL D2 is populating players, or taking from NCAA, so no issue there. The USL expansion sides, plus all of the NPSL Pro are draining NCAA significantly though. Whether active or not, DA teams populate 10 players at start up. That's one I'm sure I would be able to sort. 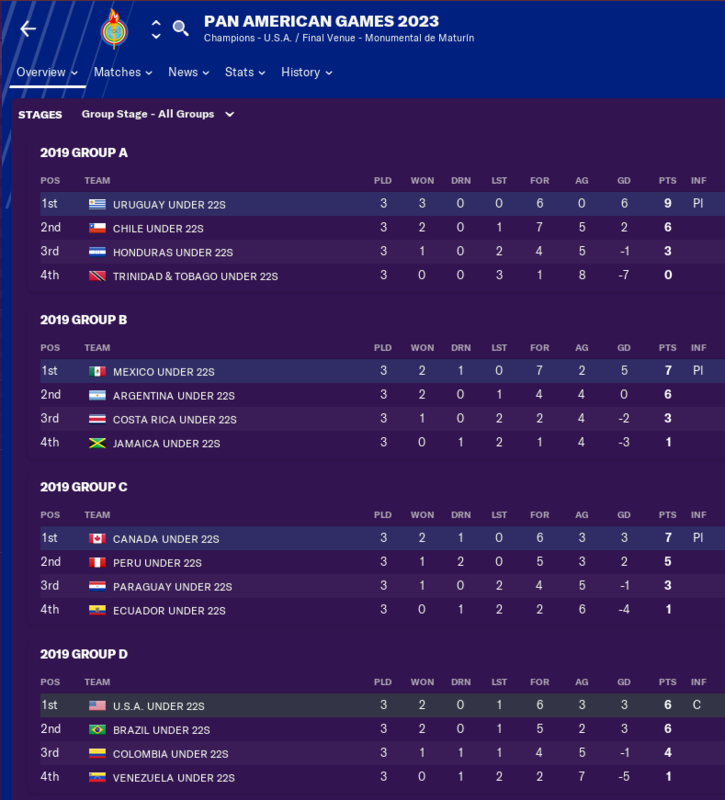 The newgen process is hard-coded i for the USA in FM. My only GUESS is that most of the USSDA clubs have zeroes in all of the Youth categories by default. I could try setting their values and seeing how that goes. But my feeling is that if that was really affecting it, then the Academies wouldn't get any newgens at all. IIRC, the balance in the newgen creation is supposed to support the long term progression through to the MLS SuperDraft. That through about 100 PDL teams in the game out the box. With 209 NCAA teams, those same players are getting stretched too thin I think.